Genealogical DNA testing is coming full circle now with the great news offered by FamilyTreeDNA. You can now transfer most versions of your 23andMe and AncestryDNA autosomal results (raw data) to FamilyTreeDNA and receive genetic matches for free as well as full access to FamilyTreeDNA's tools for only $19. And finally a FamilyTreeDNA myOrigins ethnicity admixture update is imminent! This is exciting news because customers traditionally testing at one of the other major DTC DNA services (23andMe, AncestryDNA) will now be able to enjoy the sweet fruits of FamilyTreeDNA, which has long been considered the best site for serious genetic genealogists. Collaterally at present FamilyTreeDNA seems to have the lowest amount of African-descended and diaspora DNA testers resulting in a more tepid experience for them, but I expect that to drastically change for the better with this new transfer program. Customers can now transfer 23andMe© V4 and AncestryDNA™ V2 files in addition to the 23andMe© V3 and AncestryDNA™ V1 files that FamilyTreeDNA accepted previously. MyHeritage and Genographic transfers will be supported in the coming weeks. FamilyTreeDNA still does not accept 23andMe© processed prior to November 2010. A Family Finder test will need to be purchased. 23andMe© V3 and AncestryDNA™ V1 now receive a full list of matches and the ability to use the Matrix feature FOR FREE. For only $19, the customer can unlock the Chromosome Browser, myOrigins, and ancientOrigins. This is the best value yet. 23andMe© V4 and AncestryDNA™ V2 receive all but the most speculative matches (6th to remote cousins), also for free. After transferring, if the customer wants to receive speculative matches, they will have to submit a sample and have a Family Finder run at the reduced price of $59. NOTE: 23andMe customers who tested after November 2013 are on V4, and AncestryDNA customers who tested after May 2016 are on V2. 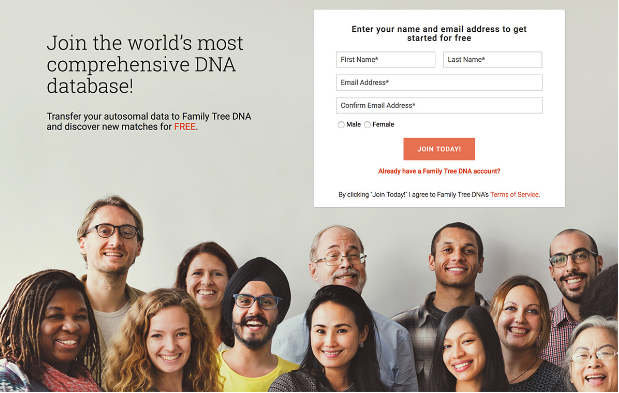 In my opinion it's very generous of FTDNA to provide all but 6th to remote cousins (that's up to 5th cousins) for respective V4 and V2 customers who don't want to provide a new sample and pay the reduced price of $59 (or $20 off regular Family Finder), and a nice savings for customers who prize those solid distant matches. Matches should take somewhere between one and 24 hours to appear, depending on the volume of tests in the autosomal pipeline. myOrigins update will be released in the coming weeks. Until then transfers will include only broad populations. FTDNA previously announced back in November 2015 that a myOrigins update was going to be released first quarter of 2016; see my blog here. Maybe it was a misprint. At any rate this is great news. Additionally, all previously transferred files that have not been unlocked will receive their matches and have access to the Matrix feature for free as long as the release form is signed. These kits will be also be able to unlock the other Family Finder features for $19. If the transfer was on a kit with another product where the release form has already been signed, then the matches will appear with no further action necessary. The Autosomal Transfer webpage has been enhanced to include a new image and a FAQ section. The FAQ section is displayed towards the bottom of the page. You should look at the FAQ section first before you flood online forums with questions. If a customer tries to transfer the same autosomal file a second time, a message will be displayed that the file is a duplicate and will list the kit number of the original kit. So please don't inundate the FTDNA transfer program with duplicate results. It is far better to test and transfer more family members. Yes it's true, genealogical DNA testing company 23andMe is now offering $20 off of kits thru February 14, 2017 Valentines Day --- that $79 for it's ancestry-only service and $179 for ancestry and health service. 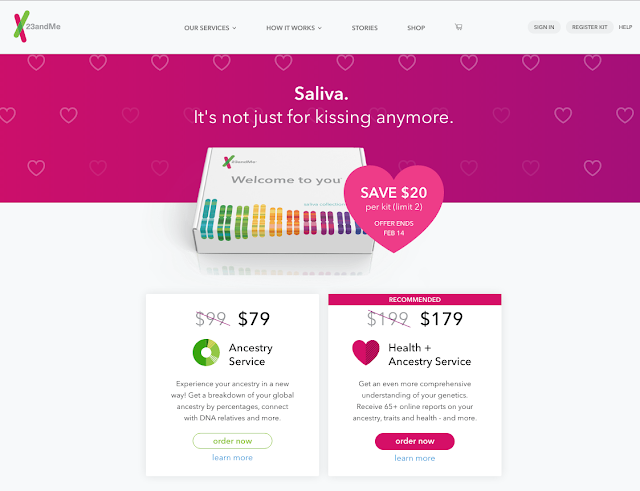 This is so sweet because 23andMe very rarely goes on sale. You can for order here. You can also read my reviews on 23andme here and here.